The business of buying and selling homes can be very stressful. It’s understandable – the commerce of real estate and brokerage in America in 2015 is currently worth $117 Billion Dollars with close to 1 Million people employed in this field. Realtor®s are an essential piece of the real estate process. 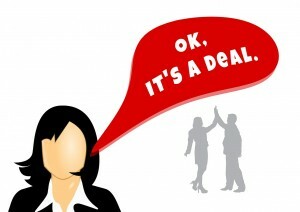 They are often the go-between for the buyer, seller, lender, broker, and everyone in between. Their jobs are very stressful, and the light at the end of the tunnel is getting a client into their dream home. 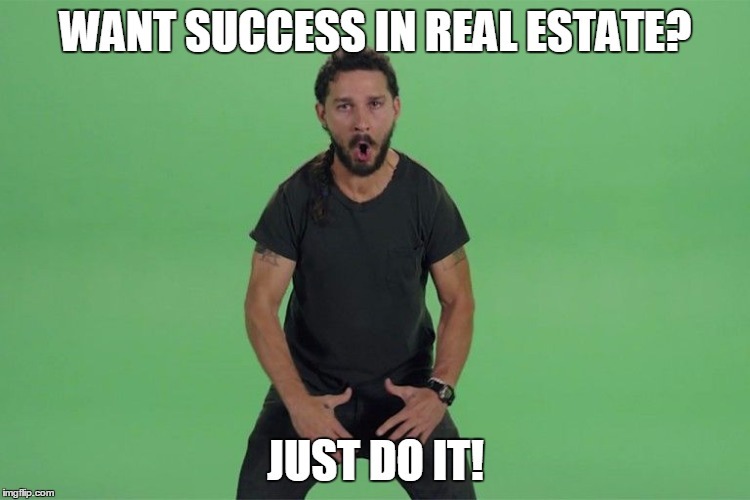 With so many people wanting a slice of the real estate market’s pie, there is bound to be competition, hurt feelings, wasted time, and miscommunication. 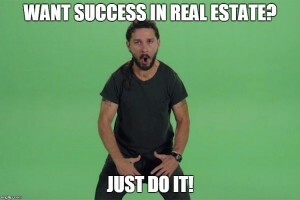 That’s why it’s a treat that the guys of TheBrokeAgent are here to smash that real estate pie in your face. 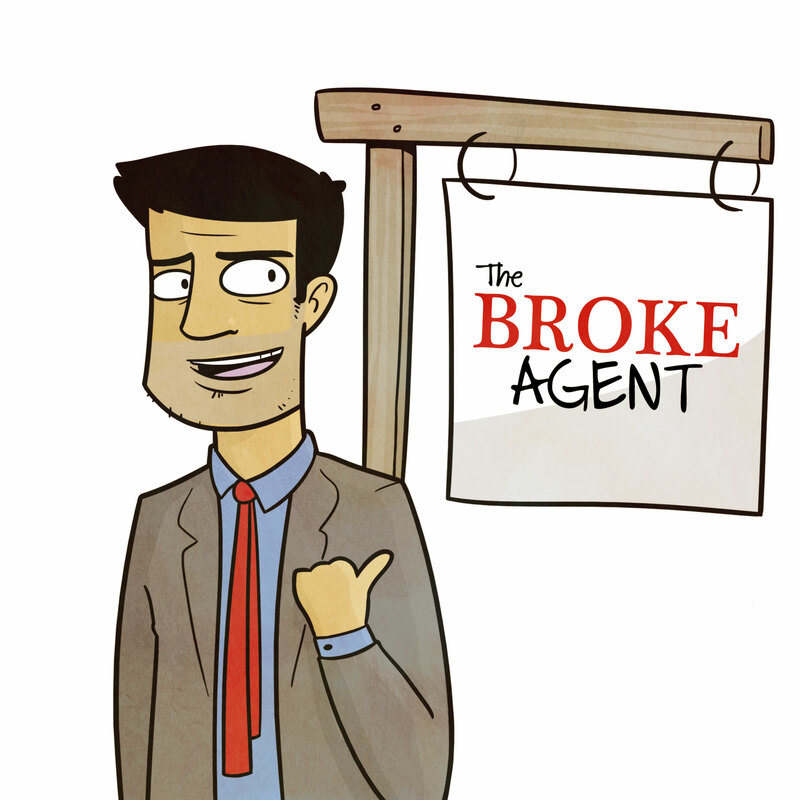 TheBrokeAgent started out at first as just a social media project on Twitter and other channels. When they got good feedback from others, they expanded to their blog to speak further and develop their literary voices. It all came together with their comics in the end. 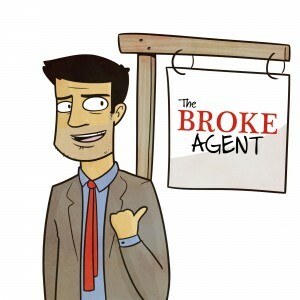 The main character and the symbol of TheBrokeAgent does not have a name. Wes and Eric say they nicknamed him “The BA” and “The Crow (because of all those Escrows).” Perhaps it is fitting that the character does not have a set name, since he can be the ultimate symbol for those who work in real estate and what they go through. Our last question to Eric and Wes was which celebrity they would want to do the voice work for The BA, if it were ever an animated cartoon. The answer, given their humor, is both a surprise, and not a surprise: Shia Labeouf. Read TheBrokeAgent’s blog by clicking here. You can also follow them on Twitter at @TheBrokeAgent, like them on Facebook here, and follow them on Instagram here. They have a bit of adult content on all of their social media channels, so please be advised. We at Federal Home Loan Centers would love it if you also gave us a follow on social media. We’re on Facebook here, on Twitter at @FedHomeLoan and Instagram here. If you are interested in a federal home loan, contact us via any of our social media channels or call 877-432-LOAN (5626). Roll the credits. Credit where credit is due. Credit cards. “Credit” is a prevalent word in our society, and this is especially true with the almighty credit score. You may remember our earlier piece on the difference between a FICO and VantageScore, but how does one boost up, or create, their credit score? The coveted credit score you will want is 720 or higher. It seems impossible, but you can get there some day. Even if you’ve had a past collections account or had a car loan, you can get to this point. In order to be given the OK for a home loan, or similar big investments, 620 is a good universal fair credit score you will want to have. Some lenders will take a score as low as 580, but it will depend on other factors such as your income and DTI (Debt to Income Ratio). Ask your bank or creditors if they provide free FICO credit scores for taking part in their services. If they do not, the lender you are looking to use will have to do an inquiry on you. While CreditKarma is popular and free, it only gives you VantageScore estimates, so don’t rely on it as your only credit score source. Choose a credit card that will benefit you the most. Do you want to travel more? Get a card that gives you air mile points. Do you go to Starbucks or use iTunes a lot? Get a card that offers you gift cards in exchange for points. Do you gas up a lot? Make it work to your benefit and get a gasoline credit card for incentives to fill up at certain places. If you can, take out two new lines of credit and alternate using each so you are diversifying your credit and getting more rewards. Just because one card offers you more rewards than the other, doesn’t mean it comes without a catch. One air mile card may offer you 10,000 more miles if you go with them, but you could have to spend $500 within a three month period versus $300 in a three month period with a competitor card. Make sure you understand the terms of getting the card reward, and factors such as interest and credit limits. Pay off your credit bills in full and on time, or if you can, pay them off before you get your statement and before the status of the bill goes from pending to permanent. Pay off collections accounts, child support delinquencies, traffic tickets, and similar debts immediately. Ask for proof of payment from these sources and keep clear of similar debts. If you have substantial medical or school debt you cannot pay off right now, the monthly payments are part of your DTI – just make sure you pay on time, all the time. If you have multiple lines of credit and a large bill for a car repair, a new computer you need for school, or a spa appointment, ask them if the payment could be split between multiple credit cards. This will differentiate your credit and help you get more incentive from each card via points or gift cards. Do not read your credit card or sensitive information such as a social security number or a password out loud in a public place. Keep track of your wallet so no one can grab your identification and payment cards. Do not ever give your personal information in reply to emails that your credit card company or bank sends you because it could be a phishing scam. Most importantly, if you suspect your identity has been stolen, alert your local police department and tell your creditors immediately. If you want more advice on how to improve your credit in order to get to homeownership, contact us today! 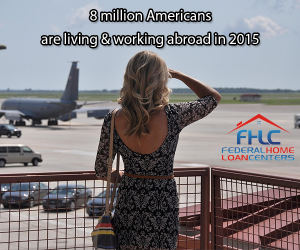 Call 877-432-5626, chat with a rep on this site, or give a follow over to @FedHomeLoan. Although Federal home loans require either a low down payment, or none at all, there is still the subject of closing costs. As discussed in our previous Loan Terms Glossary piece, closing costs are usually two to five percent of the home’s purchase amount and must be paid at the close of escrow before the title is handed off. What will these costs be for you, and can someone else pay them or gift them? 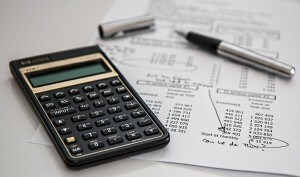 As long as the borrower undertakes responsibility for the costs, the closing costs can be financed into the loan, which makes it different from the VA and FHA closing costs. The closing costs can be gifted from someone else, such as the lender, seller, builder, or a family member. This benefit, along with no down payment, low interest, and no private mortgage insurance required makes the USDA home loan a well sought-after home loan program. Closing costs will be comparable to any conventional home loan and the FHA home loan closing costs. You unfortunately cannot finance closing costs into the FHA home loan, which means you can’t have it as part of your monthly mortgage payment. The good news is that the lender or a family member can pay these costs as a gift for the lender. A home builder is also able to pitch in, if they choose. While not a gift, the seller of the home may provide a credit for the closing costs if the purchase contract is written to include this. FHA home loan borrowers will have the typical closing costs any consumer would have to pay on a home loan and, as of 2015, sellers can pay only up to six percent of the borrower’s closing costs. With all of the interest being saved by going through an FHA home loan and the low 3.5 percent down payment requirement, you will already be saving quite a bit of money. If a VA home loan borrower has to pay closing costs, they have a cap of 1%. The Realtor®, lender, family member, or property builder can help pay for the veteran or surviving spouse’s closing costs in total as gifted funds. Closing costs can’t be funded into the loan’s monthly payments, but they can be negotiated. A good lender will always try to obtain rebates to return them back to the borrower to pay these closing costs. The seller may not pay for more than four percent of the closing costs. The closing costs may consist of a 1 percent loan origination fee, followed by a list of allowable charges during the closing process. Like the FHA and USDA loan, the seller can provide a credit to pay for the buyers closing costs if it is written into the contract. It’s beneficial, in this case, to list what the veteran may never be charged for during the closing process: the appraisal, lender inspection fees, escrow fees, tax service fees, document processing fees, charges such as faxing/mailing/stationary the broker/lender/Realtor® had to spend, commission of Realtor®s and brokers, termite inspections (except for cases of a refinance), non-title attorney costs, and builder inspection fees. If you want are seeking more detailed info on what your closing costs may be, or if you want a pre-approval, contact a representative via this site’s chat engine, or call (877)432-5626(LOAN). Feel free to tweet us questions to @FedHomeLoan. You have gotten approved for your loan, the closing process is about to be closed, and it will soon be time to move in. Sometimes, you can’t enjoy your new home right away. There could be a family illness, finishing up a job in your previous home town, or you could be a veteran getting deployed. What are your rules of occupancy with federal home loans? Let’s start with the big basics on federal home loans and occupancy. With all federal home loans, the borrower will sign an intention to occupy form which will state they will move into the home within a certain time period and live in that property for an extended period of time. There are rules to consider here. First, you cannot primarily get a property with a federal home loan with the intent to rent out to others as an investment property or to make income off of it (unless you also live on the property). Second, you cannot get a federal home loan for a property used as a vacation home or as a time share. Finally, you may not take out a loan on a property and then have only indirect family members living in the residence who are not considered your spouse, your underage children, or their direct guardian. Even if you are paying the mortgage, or would be splitting the mortgage payment with them, you would need to be the primary, full time dweller. Also, the exceptions to the “no renting” rule are if you obtain a multi-family property with the VA or FHA home loan, occupy one of the units full time, and rent out the other properties purely to pay off the mortgage and build equity, but this will be further discussed. You must be in the home within 60 days and live in that property for a minimum of one year, full time. The co-borrower can live in the residence if the primary borrower cannot be in the home within that 60 day period due to proven extenuating circumstances. As stated previously, you can rent out part of your FHA funded property if the property is a multi-family unit and the unit you rent is not the one you are living in. You can also rent out your single-family property if you are obtaining a second property for work relocation related purposes or if your family is biologically expanding in such a way that makes your current home insufficient. Renting out that first, single-family home you had funded from the FHA can only occur after that year of living there full time has passed. The USDA home loan has a bit of a stringent occupancy policy. This loan is intended to build rural communities and give people the privilege of homeownership who otherwise would not qualify. You will have a 60 day timeline to move in and live in that property throughout the term of the loan. Only the borrower and their immediate family may live in the residence. If there is a family member who requires constant care, such as a disabled adult or a child with special needs, the caretaker may live in the residence. An exchange student or adopted child may live in the home, but the adults cannot claim income off of the child, they may not be receiving any compensation for hosting the student, nor may the non-biological children add to an overcrowding situation in the home. If the loan can be paid off early, for which there is no penalty, you can move out of the property or rent it out to others once the loan is paid off. 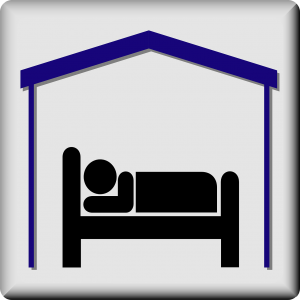 You can rent out rooms in your property under certain circumstances. These circumstances include being incapacitated and off of work, so the rented room compensates for lost wages, or if you are away for an emergency, will be out of work, and can rent out your living space only for that specified time in order to pay the mortgage. The veteran must occupy the home within 60 days of closing. Let’s say there is a Permanent Change of Station (PCS), or a veteran is deployed right before or during the process of obtaining a home with the VA loan benefit, or a veteran has a job in their previous state to finish up that is considered long distance from their new home. In cases like this, the veterans spouse can occupy the home and meet the 60 day occupancy requirement. An adult child cannot occupy for the veteran. Things change for veterans consistently.Veterans may rent out their property if they are no longer able to use the home as their primary residence. For example: If the veteran has PCS orders after closing on the home and does not have a spouse, the veteran can rent out the property. 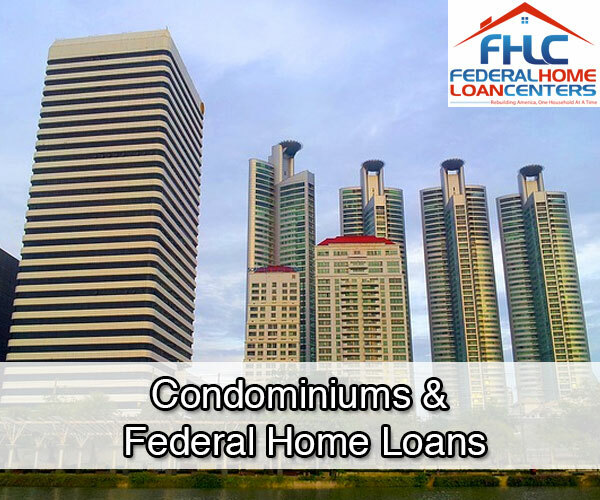 Federal Home Loan Centers is here to answer your questions on home loan benefit programs from the government. 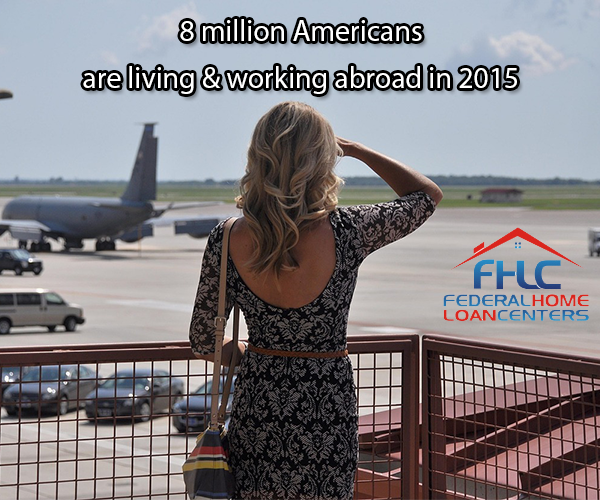 Contact us for more details by calling 877-432-5626(LOAN), chat with a rep on this site, or tweet us at @fedhomeloan. Financial hardships happen. At Federal Home Loan Centers, we don’t judge you on why they occurred. What we want is to get you that second chance at home ownership you’ve been waiting for, after learning a hard lesson. Federal home loans from the USDA, VA and FHA are surprisingly lenient on applying again after incidents such as bankruptcies, short sales and foreclosures. This piece will focus on the difference and hopefully give you the relief you’ve been looking for! 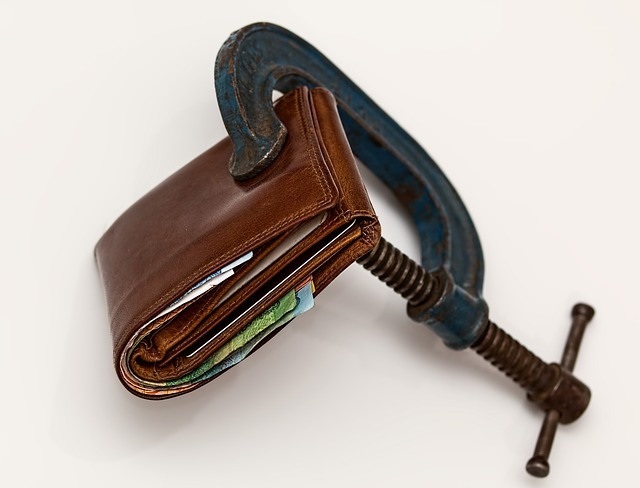 Circumstances such as medical debt, prolonged unemployment, and other issues can force us to ask the American judicial system for debt relief via bankruptcy. Your options for getting a federal home loan after these events are far more optimistic than a conventional loan. We will skip Chapter 11 information, since individuals rarely file for it, unless it’s in regards to a business. For Chapter 7 bankruptcies, your wait times will vary on eligibility for another home loan. You’ll wait two years for the VA home loan, two years for the FHA home loan, and three years for the USDA home loan, unless you are able to prove extenuating circumstances and have this wait time shaved down to one year. A conventional loan will leave you with a four year waiting time, unless you can prove qualifying situations. For Chapter 13 bankruptcies, it will coincidentally be 13 months after filing with on time payments for the VA, FHA, and USDA home loan programs. With the FHA, you can try to qualify for their Back to Work program, which can bring that wait time down. A conventional loan will have you wait two to four years. Many consumers pursue short sales when they owe more on the home than is fair market value or they can’t afford mortgage payments any longer. This option is less damaging than a foreclosure, as it shows the lender you made the effort to make their loss less substantial. Typical waiting time for the USDA and FHA home loan is three years after a short sale. This is unless you qualify for the previously mentioned FHA Back to Work program. The VA is the most lenient, as they will allow you to get your next VA home loan immediately after the short sale, AKA compromise sale, is over. The catch is that you have to have been current on all your payments before the sale closed, or otherwise, the typical waiting time with most lenders is two years. Conventional loans will have you waiting for four years after the short sale ended. A foreclosure is a very traumatizing event for anyone. To realize you can no longer afford mortgage payments is terrible. Sometimes, it isn’t even a matter of the consumer giving up, as they will pursue a short sale and it just doesn’t end up happening. For a conventional home loan, you will need to wait a staggering seven years after the foreclosure. If you go through the lengthy and emotionally draining process of proving extenuating circumstances, you may be able to lower this waiting time to three years. The great news is that for federal home loans, it is automatically three years with the USDA home loan. It will be three years with the FHA, unless you qualify for the Back to Work program. The VA is the most understanding, with their wait time planted firmly at two years. Let us help you to see if you qualify to try for home ownership. We work with clients who have suffered financial adversities, have low credit scores, or need to conduct short sales. Call 877-432-5626(LOAN) or tweet us at @fedhomeloan. If you choose to have Federal Home Loan Centers represent you in selling your home as a short sale, you can stop using our services at any time. Federal Home Loan Centers charges no up-front fees to assist you with your short sale. Our partner real estate brokerages will charge a real estate commission but if the bank agrees to a short sale, this is paid for by your lender. 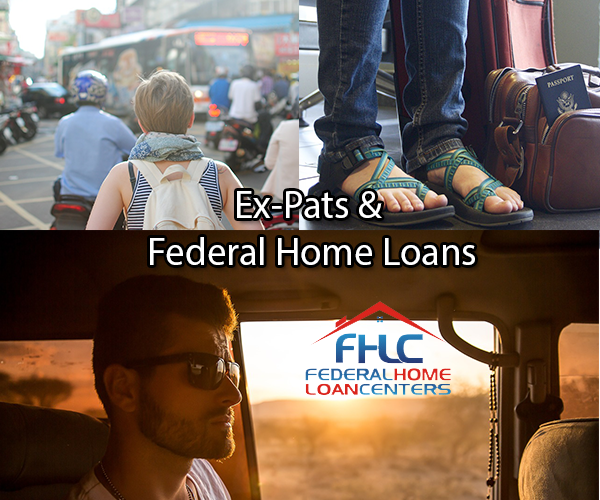 Federal Home Loan Centers is not associated with the government, and our service is not approved by the government or your lender. Even if you accept this offer and use our service, your lender may not agree to change the terms of your mortgage including approving your short sale. 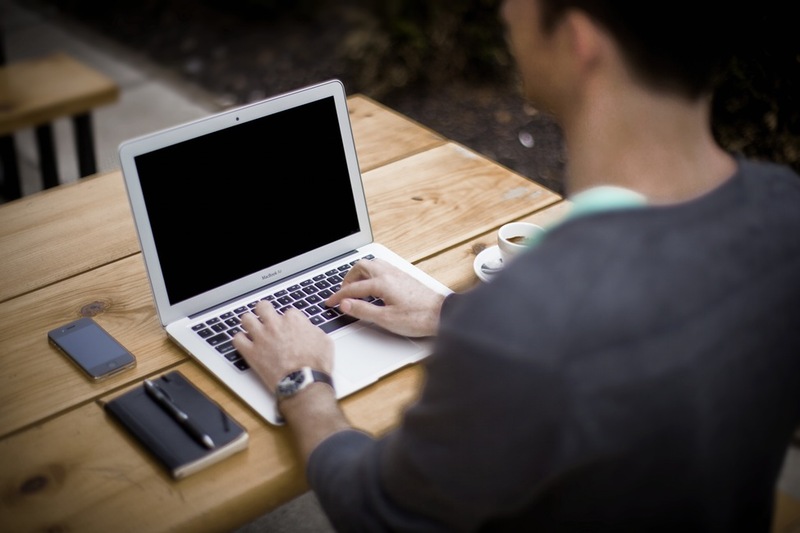 It is recommended that you continue to make payments on your mortgage throughout the process. Should you default on your payments, you can see a negative impact to your credit report and your home could be foreclosed upon. When you pay off a loan, it is a great feeling. Sometimes, later on in time, you may need to take out another one. Let’s say you are retiring and want to downgrade to a smaller home or condo in a warmer area, or you have a PCS order from the military and your family needs to move. If you have used a federal home loan program before, will you be able to use it again? This is something consumers definitely want to know. Although homes financed with a Federal home loan can be paid off early with no penalty fee, under certain circumstances, a borrower may be able to get a new federal home loan while keeping the home originally financed. This article will explore all of your possibilities to utilize federal home loans more than once! If you have paid off a USDA home loan on the previous residence, you are absolutely able to use the USDA home loan benefit again. There are certain exceptions, as well. You may not own additional property as an investment or vacation home under the USDA home loan. A USDA borrower may not keep a previous dwelling and fund a new one. The program is meant specifically for those who are purchasing their home for the first time. If your living situation with a current USDA funded home is found to be not adequate, with examples including a new disability falling upon you or growth of family (not counting adoption) overcrowds the home, then this is a sound reason, to purchase another home but it would have to be done with a different loan program. If you are not able to afford both homes, the USDA home loan can also be assumed by another qualifying borrower, so this is a great option if you need to change homes due to familial and life situations. You will be able to use an FHA home loan more than once. If the previous FHA home loan is paid off, whether it is while you are occupying the home or you sell it in order to pay off the mortgage, you will be eligible for another FHA home loan. The second FHA mortgage may be pursued after 12 months of on-time payments occurred with the first loan, especially since you will legally have to occupy that previous property for a year. There must be a valid reason to purchase another home with FHA. If you have a need for a larger or smaller home, or if you will move to a different area. Examples of this include a relocation for work that is considered to be a long distance from the first property financed with an FHA loan. Other eligible reasons include a family size increase that exceeds resources of home size (does not include adoption), or leaving a mutually owned home because of a divorce. As with the USDA loan, you must occupy as the new home primary residence that is being insured by the FHA through HUD, and you may not use the loan for an investment property or holiday home. When you are ready to pay off the previous FHA home loan, there is no penalty if it is being paid off earlier than the scheduled end date. The FHA home loan may also be assumable on the previous property you want to part ways with. For information on how soon after a short sale and other financial hardships you can obtain a new FHA home loan, call 877-432-5626(LOAN). Veterans, active duty, and qualifying surviving spouses are allowed to use the VA home loan multiple times. You can even sometimes hold two VA home loans at once, pending on the county and how much of your previous eligibility you used on the first property. The best time to use multiple VA home loans are if the previous VA home loan is paid off or the property that is currently funded is assumed by another qualifying party. One of the best parts about the VA home loan is how understanding the VA is to the changes that a military family experiences. 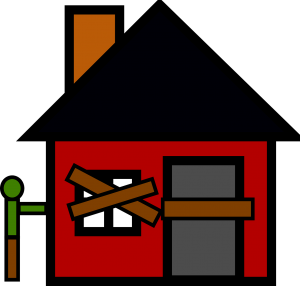 If a veteran and their family need to move to another home due to downsizing or a PCS they can take part in a compromise sale if they can’t afford mortgage payments on two properties. The best part is that immediately after a compromise sale is, as long as all payments were current before the sale was closed, the additional VA home loan can be applied for ASAP! We will be publishing another piece on the subjects of payments up until the time of the compromise sale not being current, or a military family experiencing other financial hardships. Call our office at 877-432-5626(LOAN) for information on any federal home loan. We can help you locate and fund your dream home, as well as assist with short sales and refinancing. Swing over to Twitter and follow us at @fedhomeloan, too! As with any item in your life that costs a lot of money, insurance is needed to protect it. From your car to your body, insurance keeps you from paying full price when something goes wrong. 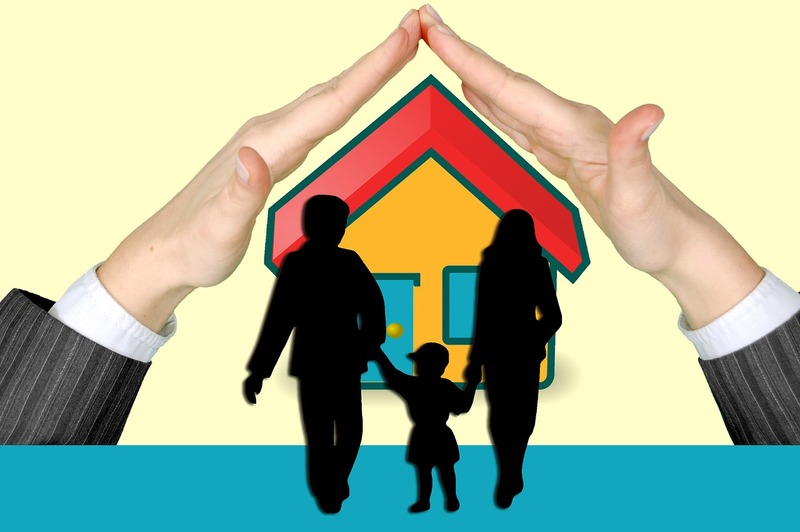 Mortgage insurance exists so that the lender is protected when something goes wrong. They are reimbursed for their losses if you default on the home loan. Even though you wouldn’t consider the mortgage a physical item like your vehicle or your physique, it’s best to picture the mortgage as a large stack of money. This is essentially what it is and the lender does not want to hand it all over to you without knowing they’ll be paid back if you fail to pay them. Conventional loans have Private Mortgage Insurance (PMI) at 0.3 percent to 1.5 percent of the loan’s amount. This can be paid through monthly premiums, or as a one-time installment. If you provide a down payment of 20 percent or more, you can skip having PMI. If you cannot leave this large of a down payment, the good news is that PMI is tax deductible. Along with having a no down payment requirement, the USDA home loan benefit for use on rural properties will be appealing to consumers due to not having a requirement for private mortgage insurance. This will make the value of your rustic or suburban home more appealing when you are saving all this money. The VA home loan benefit is wonderful for veterans, active duty and qualifying spouses who want a home loan at zero down. An added bonus for this program is that private mortgage insurance is not required. This frees up quite a bit of money for military families to find their ideal home. If you are not qualified for the VA home loan and either overqualified for, or not interested in the USDA home loan, the FHA is the best option. The interest rate for this home loan is typically lower than conventional and has easier qualification standards to be met. Private mortgage insurance is needed for this loan, but it goes under the name of MIP (Mortgage Insurance Premium) yet is still tax deductible. If you were to place a 20 percent down payment or more on your FHA funded home, you can bypass needing MIP, but most enjoy the FHA home loan option due to only having to give a 3.5 percent down payment. There will be a single, upfront MIP payment which will be 1.75 percent of the loan’s value. There will also be the annual MIP broken apart into a monthly premium. Since you are seeking an FHA home loan that is dated past January 26th of 2015, you will pay 0.45 to 0.70 percent annual MIP of any loan over or under $625,000 with a term of repayment lower than 15 years. For a loan where you’d repay it over a 15 year period of time, the percentage paid would range from 0.80 to 1.05 percent. This is an improvement over the past rates and is great news if new home owners want more time than 15 years to pay off the mortgage. If you have an FHA home loan that is less than 36 monthly payments old and you wish to refinance it, you can be eligible for a refund credit on the Upfront MIP towards the new transaction. Either way, you have options to save more money when seeking out the FHA home loan option. If you are excited to find your dream home, we will help you fund it with a federal home loan and match you with a Realtor®! Call us at 877-432-LOAN(5626), chat with us on this site, or tweet us @fedhomeloan. Do you love the concept of living in an apartment building where you’re close to neighbors, have community resources, and maintenance taken care of for you? Do you also love the concept of owning a property and being done paying for it after a time period of 15 to 30 years? Federal home loans are well sought after by Americans looking to own property. These mortgages offer low-interest and down payments as low as zero. The best part is that whether you want to live in the city, in the suburbs or in the country, you can use federal home loans to finance a condo! If you are seeking out the VA home loan and getting a condo with it at zero dollars down, your primary task will be to seek out a VA approved condo. A good VA approved lender, such as VA Home Loan Centers, will be able to provide you with a list of properties already approved, or help you to see if the condo you wish to live in is eligible. Certain items needed for approval from the VA of a condo will be a copy of the HOA budget, minutes from the past two HOA meetings, proof that common areas are managed by HOA, lender certification of met requirements of pre-sale, and an appraisal of how any commercial units in the complex affects the residents (example: if there is a three floor building with two floors of residents and street accessible businesses on first floor). For the time of closing, if the appraiser notes there is a potential termite problem, this is the only time a termite inspection is needed. Condos financed by an FHA home loan need to be approved by the Department of Housing and Urban Development (HUD). Condos that are under construction, will be built soon, over a year old, or converted from an old building may qualify. One requirement is that the condo building must be three-fourths or more residential property use. For example, if the building is four floors with four units on each floor, then only a limit of 4 units out of the total 16 units may be business use. Typically, the businesses will be on the street level, especially in cities and towns. 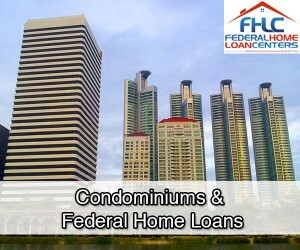 The FHA home loan may also be used on manufactured condos, such as modular condos and townhomes. The building may not be a hotel or motel property, and most assisted living complexes will not qualify. USDA home loans may be used on condos, which is surprising to some, since they may be familiar that USDA home loans may only be used on modest, single family homes. There are lots of circumstances that will keep the condo you want from qualifying, but the first step towards checking if your condo will be approved is checking the address of it on the USDA home loan eligibility online verification tool. You will need to obtain both homeowner’s insurance and flood insurance for a USDA home loan condo and the HOA fees will need to fit into your monthly Debt to Income ratio. Whether the condo unit is attached or detached from others will not have any bearing on if it will be approved. If you need a condo ID, VA condo IDs do not expire, which is great news. FHA/HUD condo IDs will be active for two years, which is a relatively long period of time. If you want a USDA condo ID, this is where it gets slightly complicated. You will need to obtain a condo ID from a property approved by either the VA, FHA/HUD, or Fannie Mae (under their Condo Project Manager tool). Again, if you use a lender like VA Home Loan Centers, or us here at Federal Home Loan Centers, we can do this tedious ground work for you. When obtaining a condo with any federal home loan, you must state intent to occupy the home within 60 days of closing. This is helpful to those moving from far away distances, for retirees or the elderly, and families with children finishing school. With the VA home loan, the 60 day rule can be waived if the borrower is the active duty soldier being deployed. Then, the borrower may start occupying up until a year after closing, as long as his or her family is occupying the residence in their place. The FHA will also have specific residual income rules with family size and who will be occupying the home. Generally, they consider a family size of five or lower to be reasonable. For the USDA home loan, there are certain people who cannot permanently live in the home. If there is an incapacitated family member and they require round the clock care, then the caretaker or “resident assistant” may not occupy the home. Family members who stay home when the primary residents leave, such as the elderly or such disabled persons, may be subject to evaluation by the USDA. The USDA condo may not be used under AirBNB or other home sharing program, as the property would be generating income. You may have exchange students as temporary residents in a USDA home loan property, but you may not be receiving any compensation for hosting them or claim them as dependents on your taxes. Foster children are acceptable, so long as they do not overwhelm a family’s resources and they may not be considered part of the client’s income or deductions. Ready to get your condo? Whether you want information on the FHA, USDA or VA home loan, contact us at 877-432-5626(LOAN). You may also chat with us on this site or tweet us @FedHomeLoan. A lot of people make jokes about how the price of every day items is going up. Coffee, hand bags, dinners out of the house, video game systems, and trips to Disney are all subject to the “I need a mortgage to do this” joke. At Federal Home Loan Centers, we thought it would be funny to put into perspective just how many of these daily items you could get with a mortgage. For all the examples, we will use a hypothetical $200,000 home loan example. With a $200,000 home loan, you can buy 85,106 Venti hot coffees, or 43,010 Venti Caramel Macchiatos, or 67,796 Venti Iced Coffees, or 40,404 Venti Mocha Frappuccinos. To put into perspective – there are 365 days in a year, so you would have enough money with this mortgage to get one of these large-sized items from the coffee chain every day for over 100 years (over 200 years for just large hot coffees). Let’s say a dinner for one person at a chain restaurant is $15 with a tip, or $25 if you buy yourself drinks. You could go out to dinner over 13,000 times, or 8,000 times if you enjoy libations with your meal. This would be going out to eat every day for 21 to 35 years. If we were to factor in fast food, which would be $6 to $10 per meal, you could have 20,000 to over 33,000 fast food meals with a $200,000 mortgage. This would be one fast food meal every day for 54 to 90 years. This is, of course, if the likely unhealthy fast food doesn’t kill you first. The Playstation 4 is currently priced at $400, the Xbox One at $350, and the Nintendo 3DS is $200. You can buy 500 PS4s, or 571 Xboxes, or 1,000 Nintendo 3DS handhelds. Let’s say the typical designer hand bag is $150 at an outlet store or $300 full price, with examples like Michael Kors and Kate Spade. You would have enough with a $200,000 loan to get 666 to 1,333 handbags. Is your closet big enough for all of those bags, though? Concert tickets can cost anywhere from $25 to $100 for regular seats, and can go into the upper hundreds to lower thousands for a VIP experience. If we are to factor in $75 for a typical, decent seat at a concert, you could attend 2,666 concerts. That’d be a concert a day for over seven years. Putting this into perspective – yes, there are many Disney parks. In the United States, as well as internationally, there are many Disney choices you have. For Disney World in Florida, there are four parks in the system. For a two day park hopper to properly experience all there is to offer, it will be $257 per adult and $243 for a child aged 3 to 9. For a vacation package with a hypothetical family of two parents and one child, aged 8, for over a week’s stay, it’s a minimum of $2,000 for the whole family. In comparison to the home loan price, this would be 100 all-inclusive Disney World trips, or 778 adult two day park hoppers, or 823 child park hopper tickets. Then, for Disneyland and California Adventure right next door, there is a one day park hopper pass, which will be $155 for one person and $149 for a child between ages 3 to 9. Or if you choose one of their vacation packages, you can stay in one of their hotels for $260 to $380 a night, but it includes free park admission and discounts on other items such as food. This is about 1,290 adult or kids tickets, or 526 to 769 nights in a Disneyland hotel. So to put this into perspective, you can either have over 100 years of daily Starbucks, over two decades of daily restaurant meals, over a half a decade of daily fast food meals, over 500 video game systems, close to 1,000 designer handbags, daily concerts for seven years, and a lot of Disney tickets for $200,000. Or, you could have a home to hand down, generation to generation, and stop wasting money on rent once the home is paid off over a period of 15 to 30 years. There is some outlook, for you. 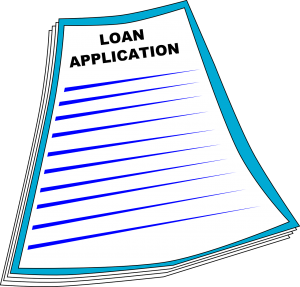 If you want more information on getting a mortgage, please fill out an application on our site or call us at 877-432-5626. We also welcome you to tweet us @FedHomeLoan. Be sure to follow us on Twitter and like us on Facebook.